The 2,000-square-foot co-op at the Hampshire House at 150 Central Park South that was for three decades the favorite Manhattan pied-à-terre of the late operatic tenor Luciano Pavarotti, is for sale for $10.5M–or as part of a two-unit, $20.5 million option to create a 3,300 square-foot three-bedroom dream home with two balconies and iconic Central Park views. The neighboring two-bedroom apartment–listed in February for $10 million–is about half the size of Pavarotti’s place, but has a 40-foot terrace with park views from every room. The resulting three-bedroom combo has 72 feet of park frontage and the kind of stunning views Central Park South is known for. 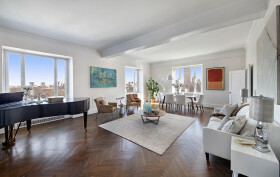 The opera star, who passed away in 2007, had several apartments in the city but was particularly fond of this one, in part because of its proximity to the Met. The other two members of the “Three Tenors” opera supergroup, Plácido Domingo and José Carreras have lived at this building as well at various times.